Subsistence rice farming is the most common livelihood in the rural communities covered by a climate risk financing study in the Greater Mekong Subregion. Photo credit: ADB. A recent study of 28 rural communities in the Greater Mekong Subregion shows that households rely on their own savings and borrow from saving groups and banks after a disaster. Given the frequency and increasing intensity of weather events, these households are in danger of falling into extreme poverty, unless they protect their livelihood and productive assets better from climate risks. This article was first posted on GreaterMekong.org. The study, which was conducted by the GMS Core Environment Program, covered communities in Cambodia, the Lao People’s Democratic Republic, and Viet Nam, which are exposed to floods (especially flash floods), storms, and droughts. Coastal Koh Kong in Cambodia also faces seawater intrusion. Floods and droughts affect livelihoods, damaging crops, fruit trees, and livestock. 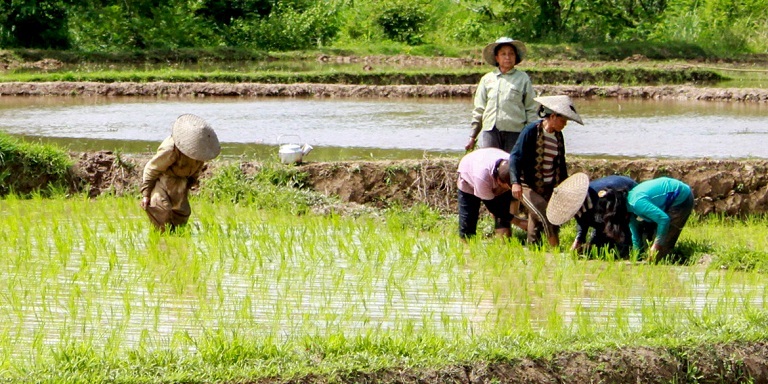 Subsistence rice farming is the most common livelihood in the communities. Extreme events, such as tropical storms, cause widespread damage to infrastructure and disrupt rural economic activities. Improving climate resilience through risk financing requires a combination of risk retention, risk sharing, and risk transfer mechanisms. The study notes that risk management strategies currently used in the at-risk communities provide inadequate protection against the impacts of natural disasters. The communities use a combination of risk management strategies: risk reduction before a disaster occurs and coping mechanisms after it strikes. Examples of risk reduction strategies are livelihood diversification, informal and formal savings, and investing to protect community infrastructure, such as dikes and irrigation canals. The coping mechanisms include the sharing of food and money, increasing paid labor work, and selling of assets. Financing strategies are limited to risk retention by households in the form of savings and loans. Climate risk sharing and transfer mechanisms are also underutilized, including for community development funds, which do not have specific strategies to manage climate risks. The study provides recommendations on how to strengthen climate risk financing in the Greater Mekong Subregion. Give incentives to households and enable them to save more money securely and cost-effectively. Focus initially on communities that have more financial resources. For community development funds, establish reserves based on a percentage of the lending portfolio. Establish a community disaster fund, which would pool resources from households and serve as a communal reserve fund. For community development funds, pool reserves with other community funds. The study also suggests looking into risk sharing mechanisms over broader geographies, such as national or regional disaster risk pools, to protect against extreme climate events. The impact of extreme climate events can be overwhelming even for national or regional mechanisms. Consider risk transfer options, such as index-based insurance schemes that tie into the international insurance market. The study says national governments and the donor community can play an important role in supporting risk financing mechanisms. This includes supporting rural financing literacy programs, providing matching grants to incentivize household saving and community disaster funds, facilitating institutional arrangements for cross-community risk sharing, supporting the design of risk transfer schemes, and financing the costs of risk transfer. The study notes that a more comprehensive analysis is required to design climate risk mechanisms for rural communities in the subregion. As a rapid technical assessment, this study is a first step toward building understanding on the impacts of climate shocks and climate risk financing. Asian Development Bank. 2017. Risk Financing for Rural Climate Resilience in the Greater Mekong Subregion. Mandaluyong.